A complete road trip vehicle roof cargo hauling solution, save and haul with a complete combo kit! Each bundle includes one pair of roof crossbars, a mesh cargo basket, and a matching weather resistant soft-side storage bag for carrying camping equipment, luggage, and sports gear. Package includes (1) RB-DLX-V2 roof basket measuring 43.5" x 39" x 6" designed to support up to 150 lbs of gear, (1) pair of RB-1001-49 roof cargo bars that fit vehicle side rails up to 1.75"W x 1.5"H at a maximum of 50" apart, and (1) RBG-01 weather resistant roof luggage bag measuring 38" x 38" x 18" for 15 cubic ft. of covered storage. Hardware required to install the vehicle basket and roof bars is included. Roof cargo bars hand-crank for tightening and feature a key locking mechanism for added security. RB-1001-49 roof bars require a 2" minimum side rail height for mounting. Roof cargo bag is water resistant, made with heavy gauge nylon fabric with a PVC coating, featuring a concealed zipper instead a weather flap. Mesh cargo basket provides plenty of tie-down points for strap attachment when carrying cargo with or without the storage bag. Existing vehicle side rails are required in order to clamp roof bars for installation. Includes matching vehicle roof cross bars, cargo basket, and roof luggage bag packaged together for maximum savings! 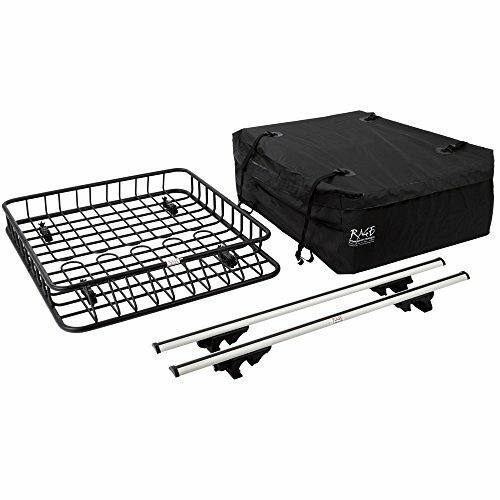 RB-DLX-V2 roof basket supports up to 150 lbs of gear, measures 43.5" x 39" x 6"